Before receiving this Premium Ceramic Knife set, Oma knew nothing about ceramic knives. I learned that the hardness of these ceramic knifes gives them their long-lasting good looks, as well as a razor sharp edge that does not require sharpening for years. This sharpness makes slicing easier, allows precise cuts and extremely thin slices. However, while ceramic blade are stronger than steel, it is also more fragile because it is more brittle. That means that if you drop a ceramic knife or attempt to cut bone or frozen foods with one, it can break or chip. The Elegana set is really very stylish. I love the different colored handles. 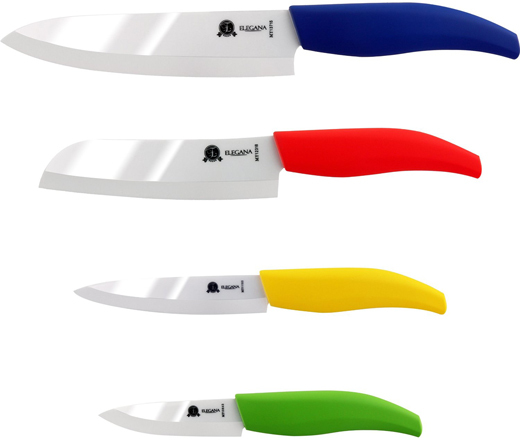 The set comes with a Green 3" Paring Ceramic Knife; a Yellow 4" Fruit Ceramic Knife; a Red 5" Santoku Ceramic Knife; a Blue 6" Chef Ceramic Knife; four matching Color Protective Sheaths; a dark blue Ceramic Peeler; and a Polishing Microfiber Cloth. These tools are FDA and LFGB Certified and BPA Free. Tip: Hand washing is recommended. No matter if you are a professional chef, a mom cooking for her children or a college student, you need a professional and sharp set of knives. 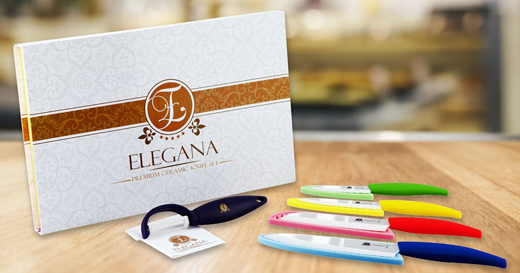 Elegana is a premium supplier of high quality kitchen products. 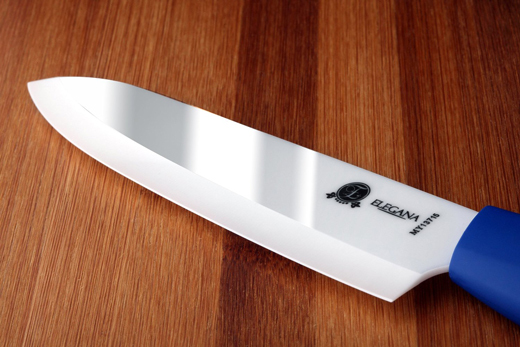 Our ceramic knives are ultra-sharp & can retain its sharpness longer than conventional stainless-steel knife. We use a new Cold Isostatic Pressing (CIP) technology that creates a blade HARDER, STRONGER, and the crafted blade edges are up to 30% sharper than our competitor. #1 QUALITY CERAMICS: - Up to 2x sharper than steel - Guarantees a tougher and more durable blade! Make ultra-thin slicing, dicing and gliding through food effortlessly. 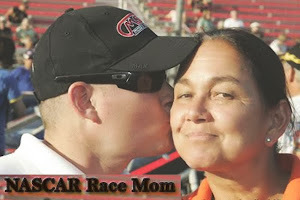 SAFE: Germ resistant, BPA free, nonporous, odor free blades and NEVER rust! Stores safely in beautifully made protective blade covers. VALUE: 10 piece ceramic knife set includes 4 white mirror finish ceramic knives, 1 multi-purpose ceramic peeler, color-coded protective sheaths, polishing microfiber cleaning cloth and premium gift box.